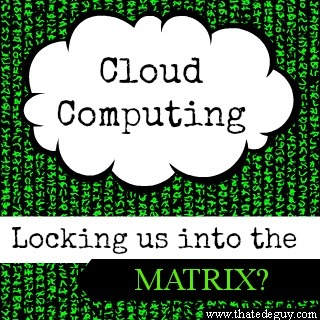 Cloud Computing: Locking Us Into the Matrix? Cloud computing is being called the best thing that’s hit the technology sector since multiple core processors. It gives small businesses the ability to tap into super computer power without having the cost of building the super computer. The business pays for usage of the cloud rather than for all the hardware and upkeep of the computers. An example of a sector that’s rising in its use of cloud systems is the accounting world where we’re seeing a lot of cloud accounting software rolling out. It’s a good deal; giving the small-timer the ability to handle spikes in computing need without breaking the budget. Is cloud computing a trap though? Richard Stallman thinks so. In a recent interview with The Guardian, Stallman called cloud computing “stupidity”. He’s in good company too. Larry Ellison, the founder of Oracle, is quoted in the same article as calling it “complete gibberish”. Stallman is the founder of the Free Software Foundation and the creator of the GNU operating system so he knows a bit about free and community supported softwares. Of course, just because they say it’s so doesn’t make it so. But, he and Ellison bring up some good points. If we’ve got all our data in the cloud, the cloud becomes a pretty good sized target for those who would like to have our data. The most convenient cloud application in the world isn’t going to seem so convenient when someone is leaking your customers emails all over the internet. Or worse, their passwords and credit card information. Or, what happens when you’ve stored all your data in the cloud and the cloud goes away. Or when you depend on the cloud’s computing power to maintain your business, and it suddenly goes away? You might wish you had a little bit of that control back in your own data center. Truthfully, I’m like a lot of people in the digital world today. I use gmail, store quite a few of my files on Dropbox, and count on any number of sites and services that use that same cloud technology. And when I stop to think about the cost of replacing any of those with the hardware and software to recreate those solutions, I shudder a bit. I’m payment averse, so it’s not like I’d be replacing software and services that I already pay for. No, I’d be replacing software and services that are free. Maybe they’re ad supported, or limited in some way, but they work. I like being able to access my data and information from any number of places just by logging into a website. I understand that there is a risk of my data being compromised. But, I’m a personal user. Very little of what I have out there is so personal in nature that it would compromise me if it was hacked and released. Any business taking the same risk has to weigh that against the cost of replacing the software and services that they are already using. Another concern, brought forward by Stallman, is that of the proprietary nature of many of the softwares and services. Google Drive, for instance has it’s own format (much like Microsoft Office does) that doesn’t transfer well to any other service. Many other services make it overly hard to retrieve all of your data from the service without a lot of hassle. What risk is there in having your data locked into the “Matrix” of cloud computing? What do you think? Is cloud computing truly the wave of the future? Or is it going to become so risky that it fails due to lack of use? Does the proprietary nature of many of the services cause undue hassle?